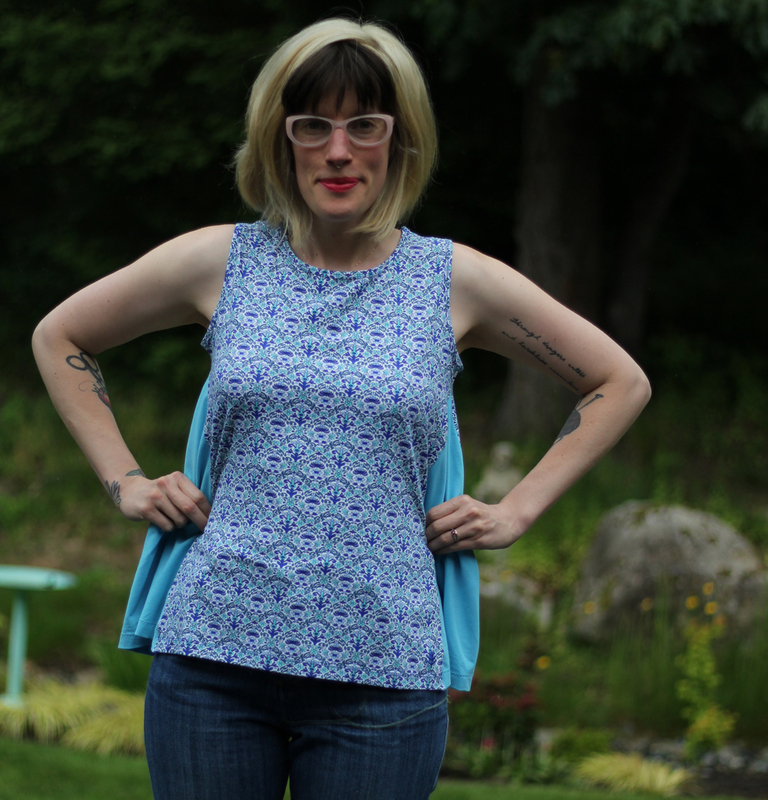 When you like the way a shirt fits through the chest and shoulders but it’s snugger on your belly than you’d like, you can easily give new life to an already-existing tee by adding a godet into the side seam of a t-shirt. What’s a godet? 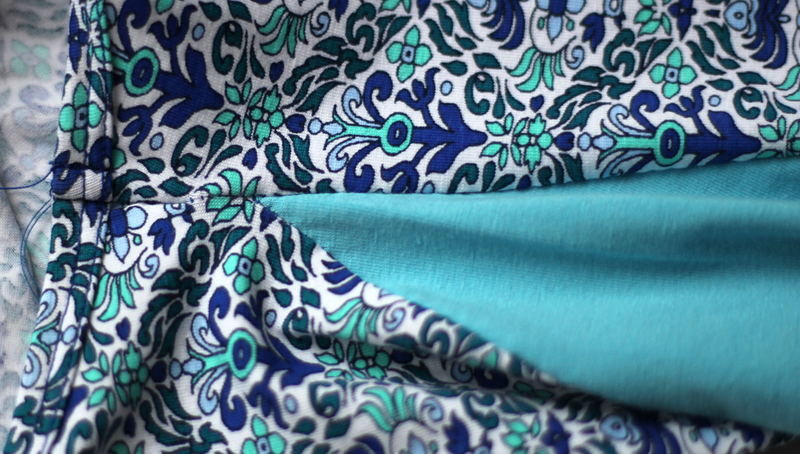 A godet is simply a triangle of fabric that adds volume to a garment. 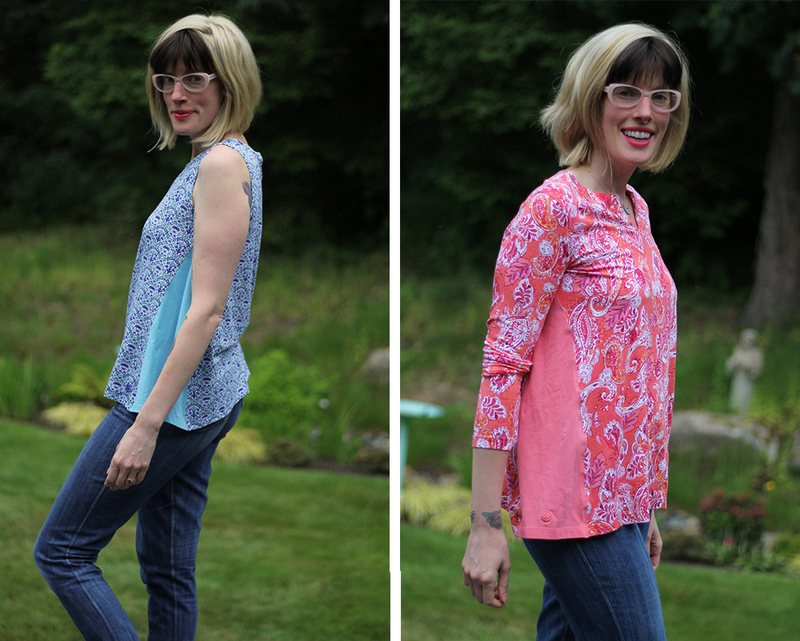 I’ll show you how I took two different ready-to-wear t-shirts and made them from snug to loose at the waist by adding in triangles of fabric to the side. 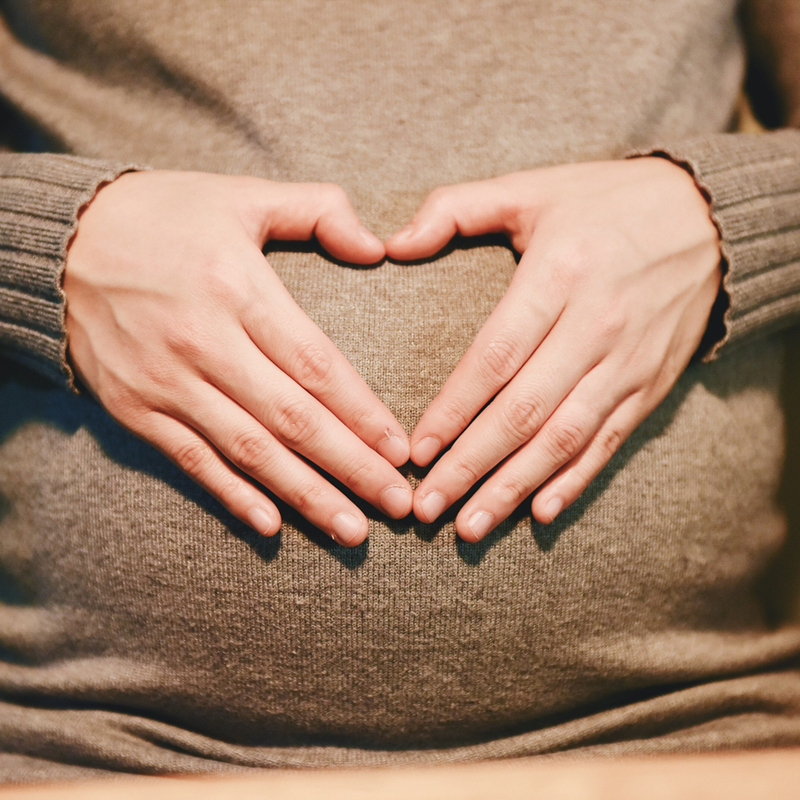 Rescue a shirt from the back of your closet that you don’t like how snug it is on your new mom belly or grab that adorable shirt you found at the thrift store and make it work well for your newly pregnant belly. 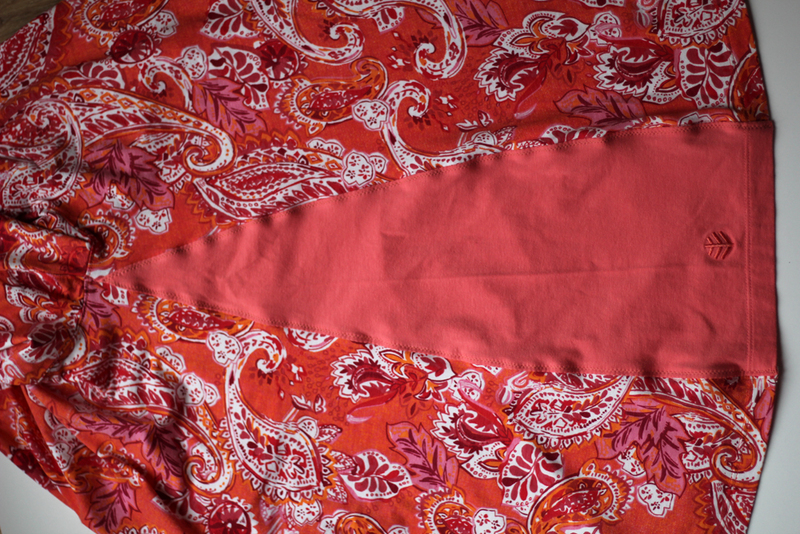 Start by cutting off the side seam of your shirt, stopping your cut 1/2″ below the top of the seam. My pink shirt had a little vent in the bottom and I just ignored it. (If you really want to you can unpick the stitching instead of cutting the seam but I’m of the opinion that ain’t-no-mom-got-time-for-that). 2. 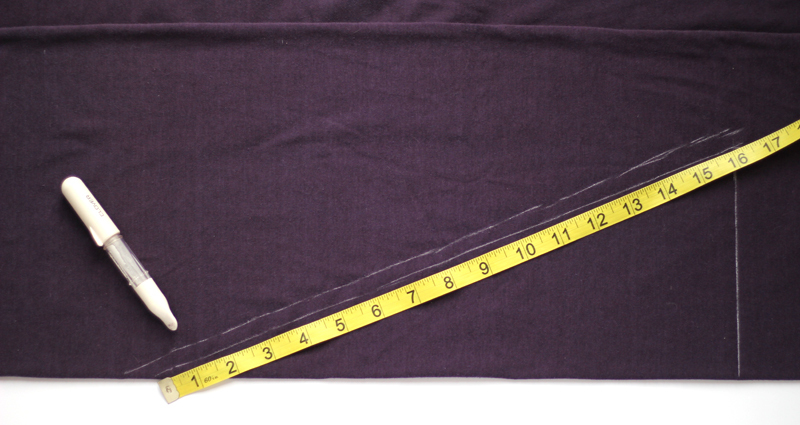 Then use a ruler to measure from the end of the line to the point on the fold that is your seam length away. 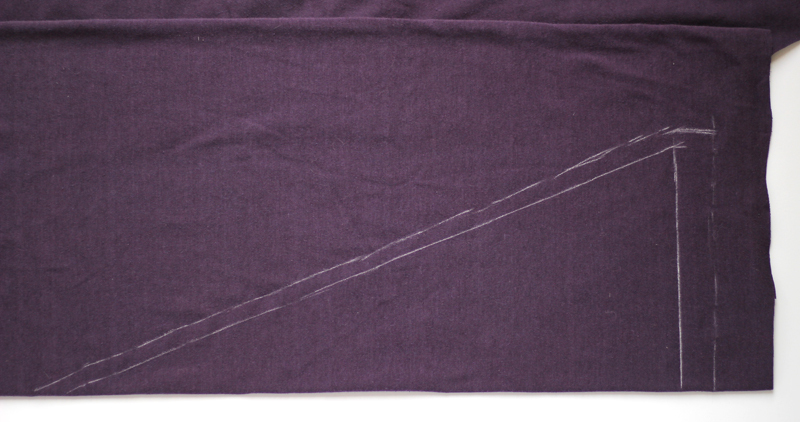 Draw a second line just a bit out from this line to give yourself a seam allowance. 3. 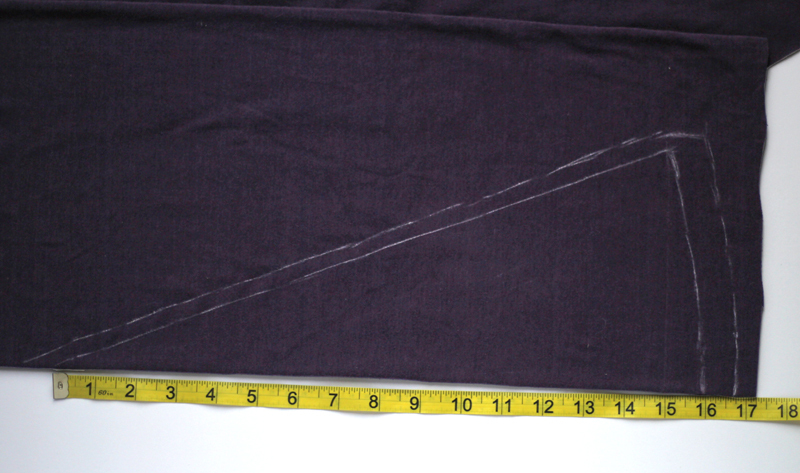 Draw a second line below the bottom that is your hem-height away. Cut out your triangle. In the pink shirt, I made each triangle 7″ wide at the bottom. This is enough to take a snug fitting shirt and make it loose. 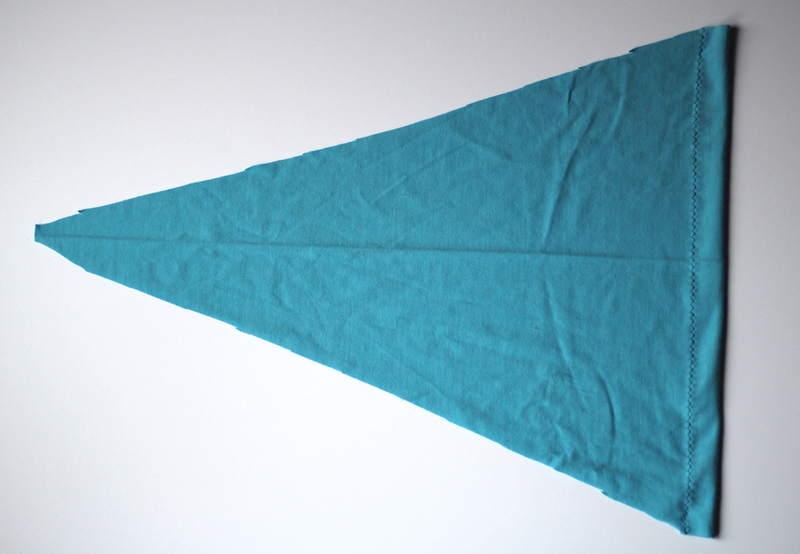 For the blue shirt, I made each triangle 13″ wide at the bottom. This makes a snug shirt into a swing shirt. Start by hemming your triangle. 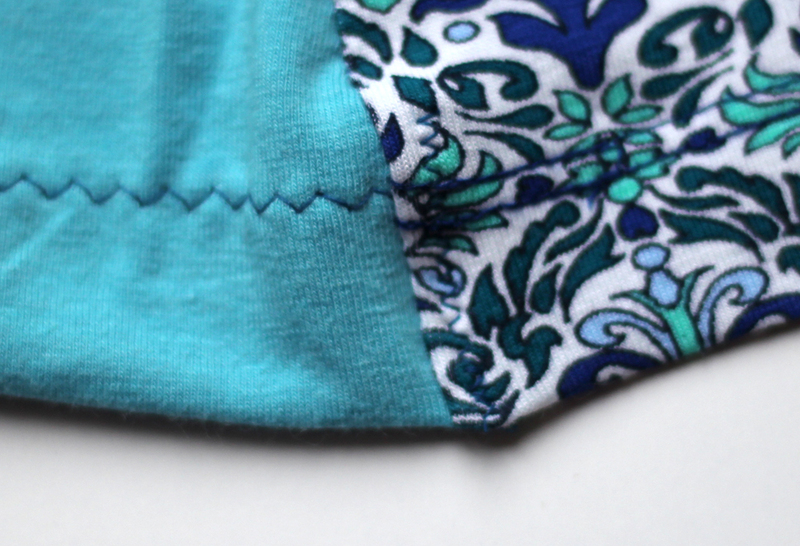 Remember to use a zig-zag stitch or other specialty stretch stitch for all your seams because you are sewing with knit fabric. 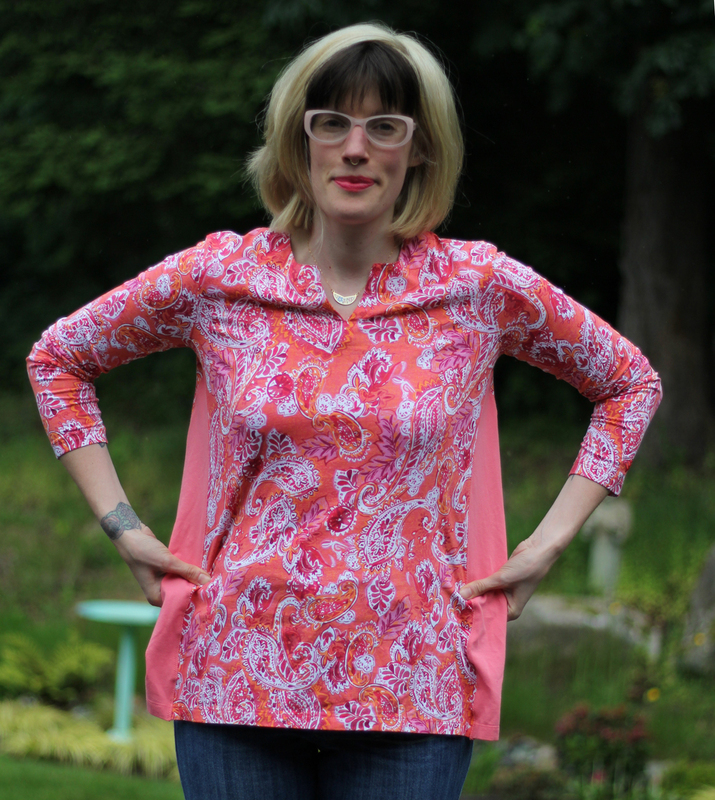 For the pink shirt I actually cut the triangles from another matching shirt so I used the existing hem as the bottom of the triangle and saved myself a step! 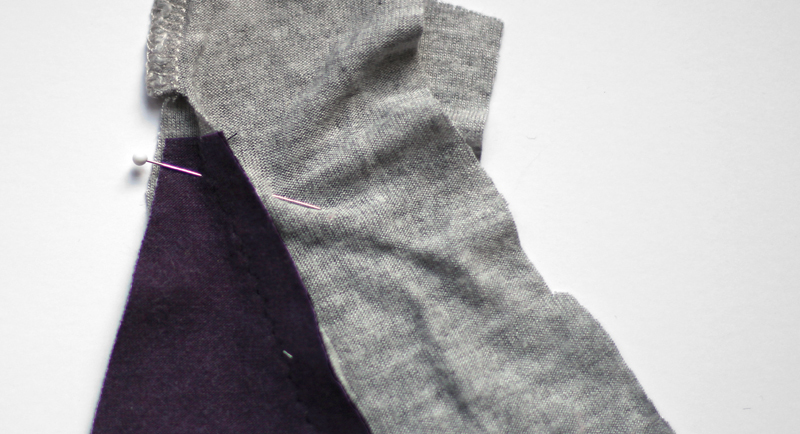 Sew the godet to one side of your seam. Start with the top of your triangle 1/2″ down from the top of where you cut (which is 1/2″ down from the top of the seam so your triangle starts 1″ from the top of the seam). Make sure your godet and shirt are even at the bottom. Sew the godet to the other side of your seam. 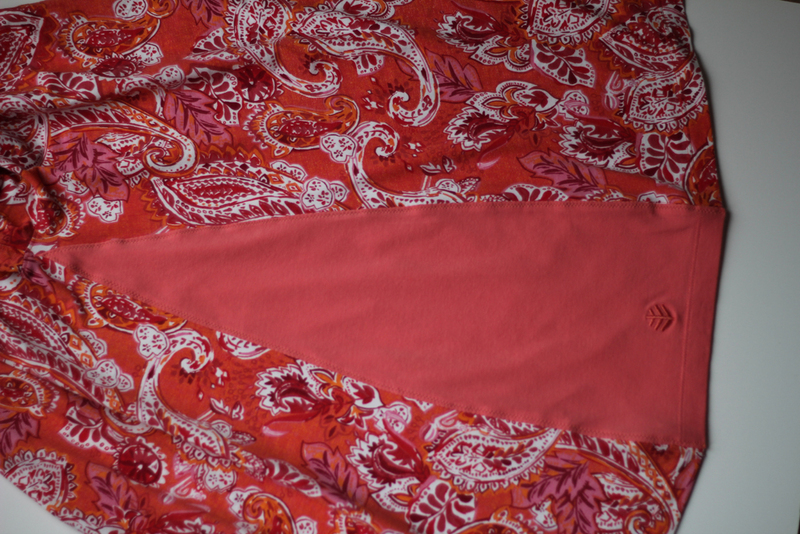 Start by lining up the godet edge with the shirt seam edge. Put a pin through the godet and shirt seam a bit down from the top of the godet to mark the point of the V – this is the point where the seam on the left and right of the godet will meet so make sure it is on the seamline you just sewed. This is what it looks like on the other side, the side that you will now sew. 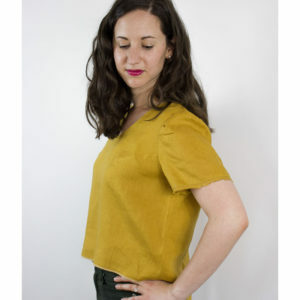 Starting in the 1/2″ of existing seam at the underarm, stitch down the side seam, gently angling your seam out so that you sew right over the point marked by the pin and then continue to stitch the seam down to the hem of the shirt. This is what it looks like on the inside after inserting the godet. This is what the right side of your godet looks like. If your triangle doesn’t come to such a neat point don’t sweat it! It’ll be under your armpit and nobody will ever see it. You can add a bar tack to the top of your godet for extra strength if you are worried about it pulling out. 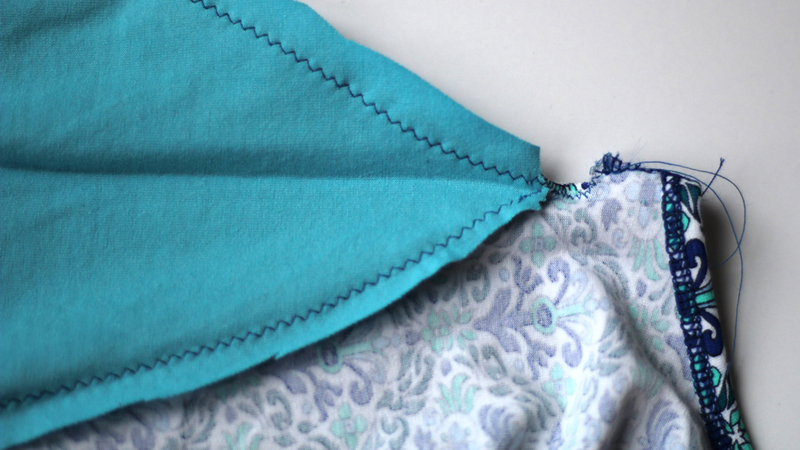 If you would like to make the seams as smooth as possible, press them all one direction (either into the godet or away from the godet) and topstitch the seam flat. 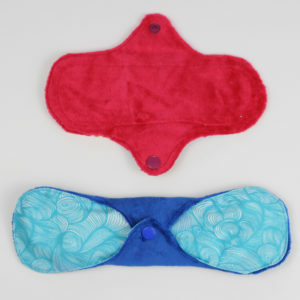 This will minimize the rubbing the fabric can do on your body. 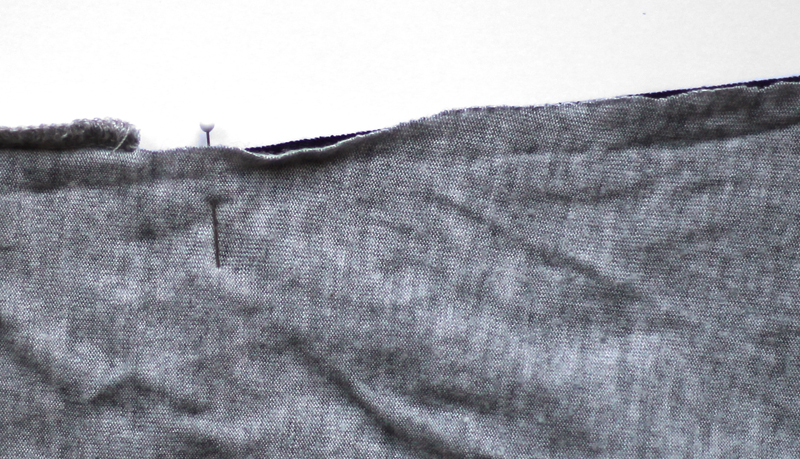 If you don’t topstitch the whole length of your seams, you do need to add a little tack to the bottom of the seam where the godet and shirt meet to keep the bulk flat where there are 4 layers (the godet, godet hem, shirt, and shirt hem). You can press them to the shirt or to the godet. 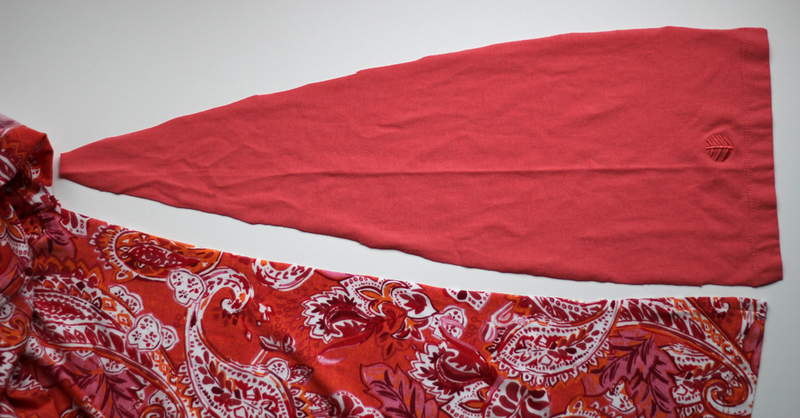 You can smooth out stretching or bulging in your fabric by pressing it. 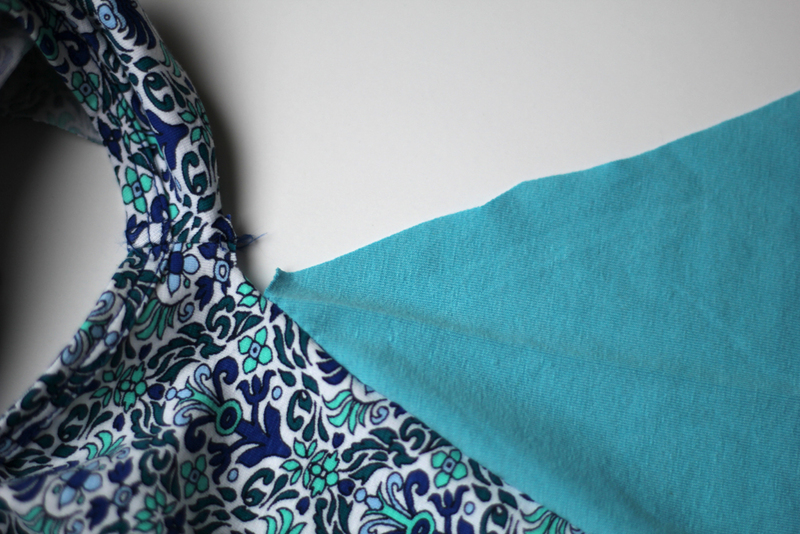 Yes, you can press knit fabric! Make sure to check the temperature on your iron as your fabric is likely to have synthetic content. There are definitely more precise ways to insert a godet. This tutorial is meant to be quick and easy. Things don’t have to be done the “best” way to get the job done! This doesn’t change how the shirt fits at the bust and shoulders so make sure that you like the fit there before bothering to change the fit at the waist. If a shirt is too small all over before starting, this tutorial won’t help you. Curves takes up both width and length of fabric so if you want to do this modification to wear during later pregnancy, remember that the shirt will ride up in front. 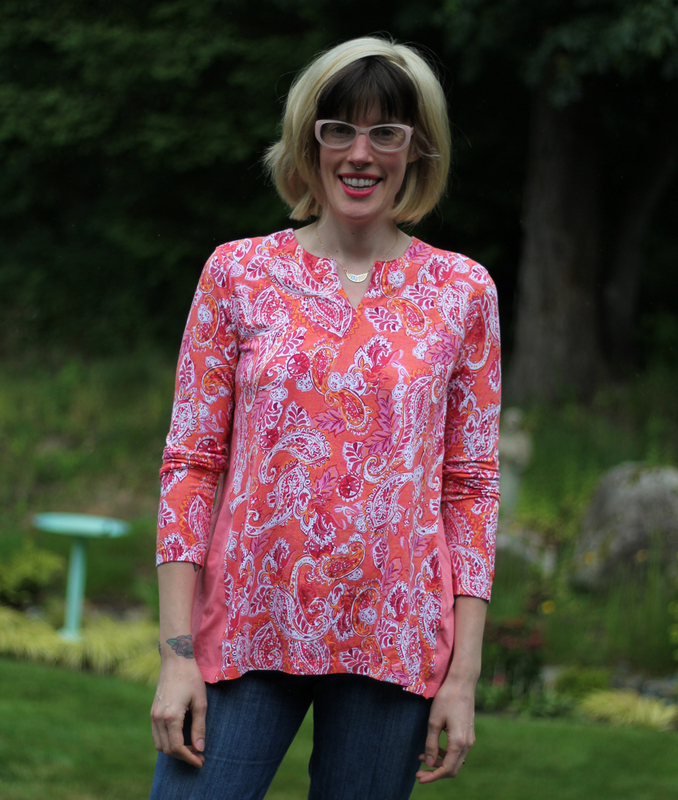 This tutorial is aimed at knit tees since working with wovens requires more precision since you can stretch knits to fudge small differences. The wider your triangle the bigger the difference in measurement between the sides of the triangle and the height of the triangle. 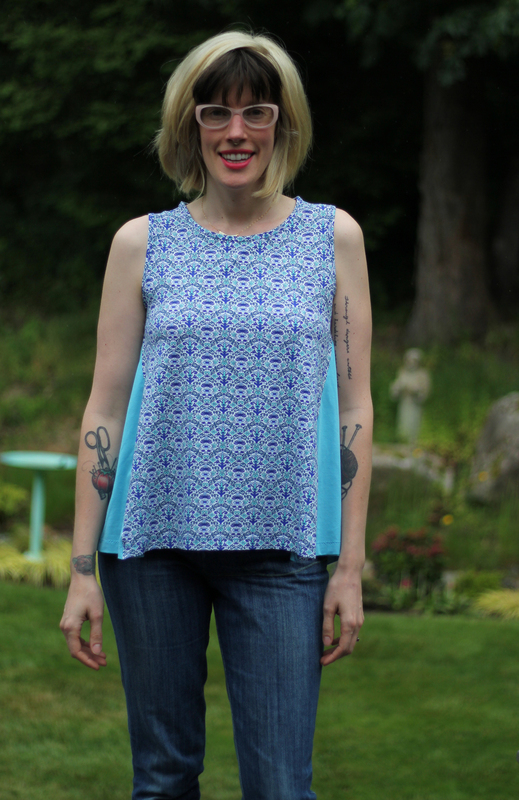 This means that your hem won’t be even all the way around your shirt but will dip up a little in the middle of the triangular inset. If this will bother you, after chalking your triangle, you can erase the bottom line, measure from the top point along the fold the same length as the side, and draw a gentle curve between fold and side. 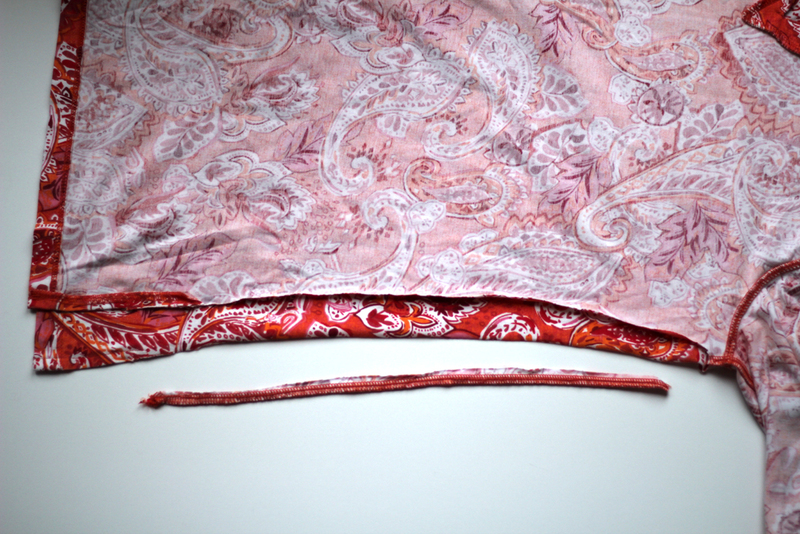 We didn’t write the tutorial this way because it is harder to hem along the curve. 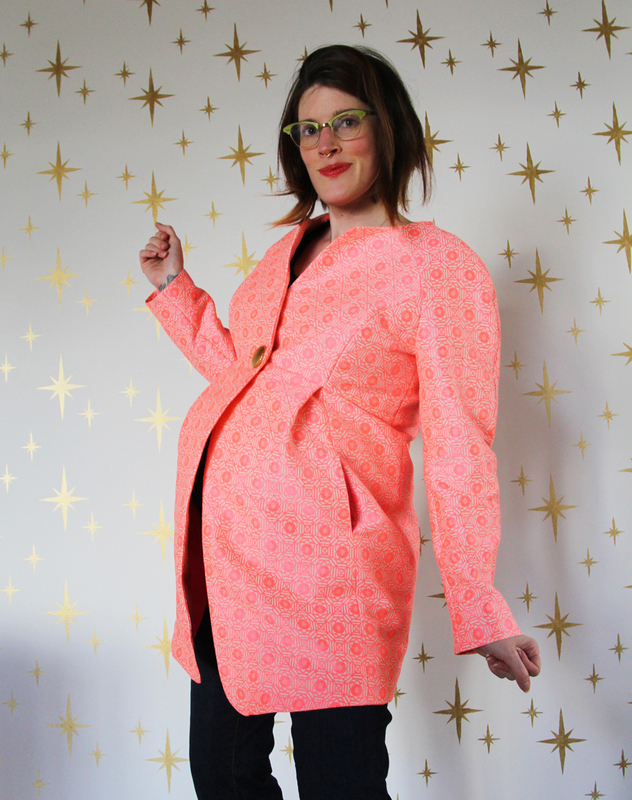 Erin is one of the co-founders of Maternity Sewing. She also publishes patterns as Tuesday Stitches where she publishes patterns to help you play Every Day Dress Up, whoever you are. She believes in empowerment through sewing and encourages inclusivity, representation, self-love, and self-expression.